«Oh, I can smell the mountains» – a lady shouted as she tasted Edelwhite Gin for the first time at an awards ceremony in London. 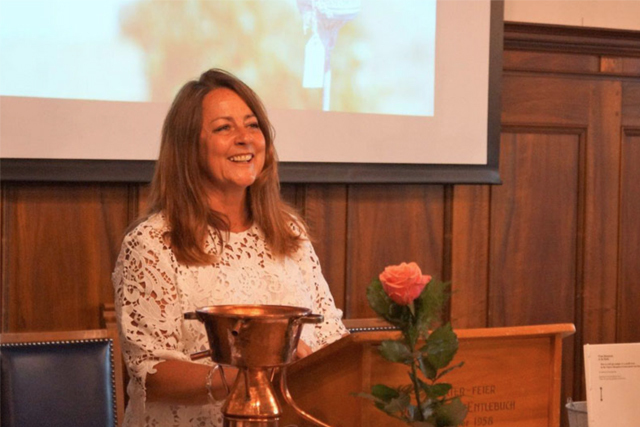 «This description fits perfectly» founder Barb Grossenbacher explains. She created Edelwhite as a thesis project for her further education as Weinakademiker. 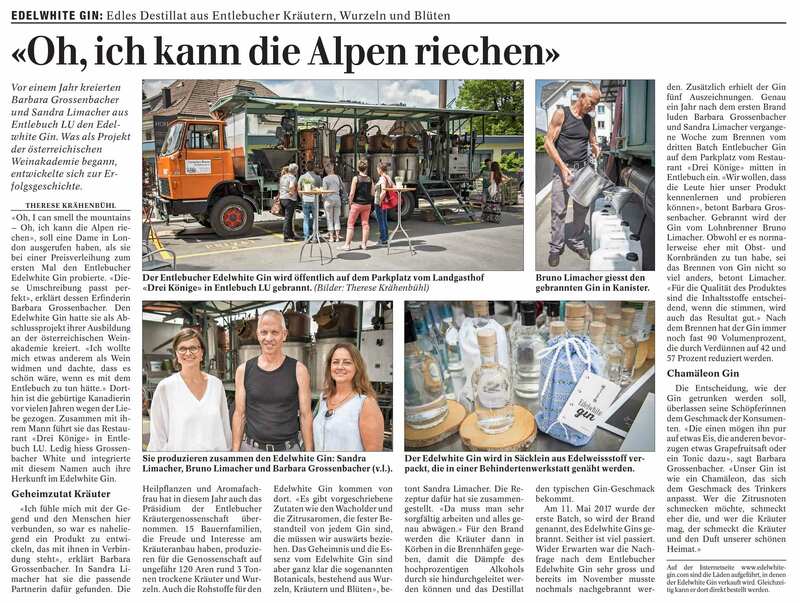 I wanted to do something more creative than simply writing about wine, and thought it would be nice to dedicate my work to something about Entlebuch. This is where the Canadian-born has moved and runs the Landgasthof Drei Könige with her husband after meeting him Canada. Barbara’s maiden name is White and the name Edelwhite is a play on words with German and English. 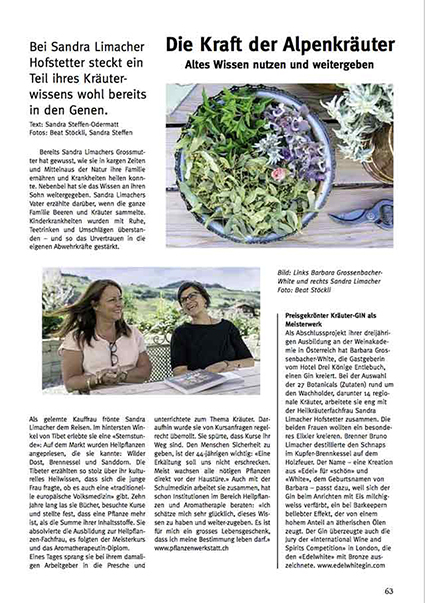 I feel very at home in Entlebuch, and close to the people and nature itself, which is why it was easy for me to create a product that reflects the area. Sandra Limacher was the perfect partner to help with the project. The Aromatherapist and medicinal herbal expert is also the president of the Herb Cultivation Cooperative in the town. 15 farmer families produce 3 tons of dried herbs and roots for the organization. Many of the botanicals in Edelwhite Gin also come from the Cooperative. «There are botanicals that must be present in gin, such as juniper and fresh citrus, which we of course must buy outside of the area. The secret of our gin is definitely the mixture of botanicals that grow here.» says Sandra Limacher. She is responsible for the recipe. «We must weigh and measure all botanicals and be very exact and precise.» For the distillation the ingredients are added to the alcohol in the copper pot directly or in hanging baskets where the vapor from the alcohol releases the ethereal oils that give us the final taste. The first batch distillation of Edelwhite Gin took place on May 11, 2017. Since then a lot has happened. The high demand for their product exceeded their expectations, and Batch 2 was distilled the following November. In the first year Edelwhite was proud to accept 5 awards. 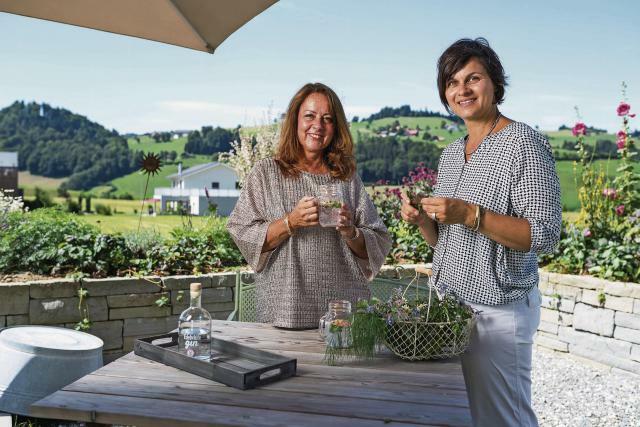 Exactly 1 year from the distillation of Batch 1 Sandra and Barbara made a town party on the parking lot of Landgasthof Drei Könige in Entlebuch. 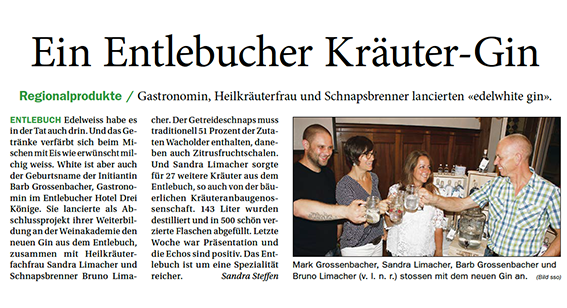 «We wanted the townspeople to learn about our product and come and taste it for themselves.» said Barb Grossenbacher. Edelwhite Gin is distilled by Bruno Limacher, a familiar face in town much respected as a master of his trade. Although he usually works with fruit and grain products, Bruno said that the process for gin is not a whole lot different. The quality of the end product depends on the ingredients, when they are balanced and in order then a good result is almost guaranteed. Post distillation the final product has an alcohol per volume of nearly 90%. This is then diluted to 42%abv. 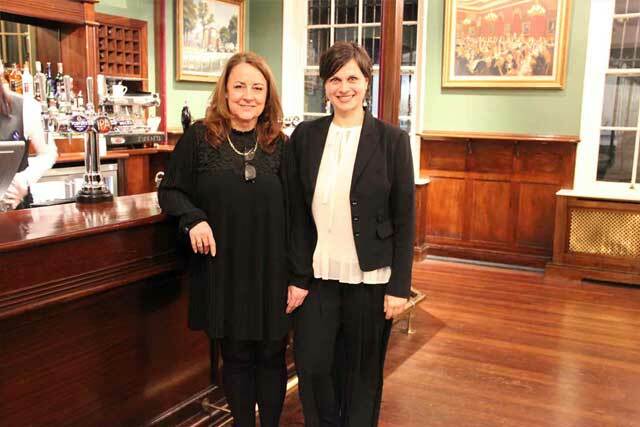 The creators of Edelwhite Gin leave the decision about how to drink it to the consumers. Some like it pure or with ice, others with grapefruit and tonic. Our gin is like a chameleon, and adapts to match the drinker’s taste. There are people that smell and taste citrus notes while others find herbs and spices dominant. Ideally, all people can recognize the fragrance of their homeland, Switzerland. Der zweite Edelwhite-Gin-Batch ist gebrannt worden. Entlebuch is popular for its herbs and berries.